It’s the middle of the summer eclipse season 2013! Lunar! Solar! Partial! Full! Whatever! A one word can suffice: change. Yeah, okay. But what kind and what for and what to do about it? Well, how its playing out in each of our lives can be somewhat different but the main theme is change. So, it all started in April with the Full Moon Lunar Eclipse in Scorpio; so a Scorpio Moon; check your schedules, journals, calendars or reflect back to the 25th of April during that full Moon. (I did and see a theme developing with finances; not surprising when we’re dealing with Scorpio and the opposite polarity Taurus. They rule the 2nd and 8th zodiac houses of our money/other people’s money—generally speaking as a huge over-simplified theme. Survival, values, self-worth and issues of power/control and these types of categories—that’s what we’re talking about, if we’re getting thematic and we are. TECHNICAL—SKIP THIS PARAGRAPH IF YOU’RE NOT ‘INTO’ ASTROLOGY: Most people don’t know these details about themselves but I’ll mention anyway that if anyone has planets in Taurus, Leo, Scorpio or Aquarius that are between 1 and 11 degrees, that this energy will be most deeply felt. Why? Because this upcoming Full Moon Eclipse on the 25th of May happens at 5 degrees and is triggering the lot of any planets in those signs and in those degrees via aspects or angles, that’s why. But even if you don’t know those details, everyone has transiting Saturn (in Scorpio) and Mars (in Taurus) triggered at that time. So, you’re effected with or without knowledge of your planets, houses or signs. But knowledge is power, so let’s continue. Although I just said that I’d leave myself out of it, Saturn in Scorpio brought (for me) deep emotional sadness (my brother had just died) and other emotions had me initiating (Mars) some new ideas about monetary survival concerns (Taurus). I’m sharing this for the purposes of helping others understand their own astrological eclipse energy as I try to figure this thing out myself. What is the message that is being given to us by the universe this eclipse season? Eclipses can suddenly expose a hidden problem and are like the ‘wild cards’ of the zodiac which can bring up stressful emotions, chaotic events or they can be very positive and exciting. I’m sure there are those who feel little or no effect at all. Why so? Well, it depends on whether or not those signs relate to something significant in the natal chart triggering the soul’s karmic past or evolutionary goal—some eclipses do and others don’t. Just because someone experiences an eclipse season as mild, doesn’t indicate some type of spiritual advancement. Besides, let’s face it. If we got hit intensely and heavily with each and every single eclipse, chances are we’d be overwhelmed—that’s why we have something called ‘time’ to slow it all down for us. So, wipe the grin off your face if you are not being affected by this particular eclipse, there’s always next year! My Natal North and South Nodes are being hit by this eclipse season so my soul’s karmic past and evolutionary intention are really being shaken. Last year, the summer eclipses (in which I relocated from the mountains to this apartment complex down mountain) occurred I the signs Gemini-Sagittarius. One archetype of this zodiac axis relates to short trips and travel—that axis in my natal chart occurs in 5-11, the archetypes of children (5th) and the clan/community (11th). I’m in the community now “fer’ shure” as we used to say it in the 80’s. I moved into this apartment complex where my children live. And I did so last year between the May 20th and June 4th eclipse. My move in date was the 21st of May last year, 2012. So all that Gemini-Sag eclipse stuff that last year is being mentioned here as an example of how an eclipse season can work. Let’s get current–it’s now one year later, May 9, 2013. So much for history; let’s return to the NOW. 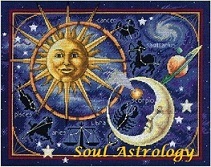 Scorpio – Taurus is where we’re at for this years eclipse season encore. And for me triggers more family/career stuff since in my life, the natal nodes are in the 4-10 house axis. Again, if you are born with personal planets in Taurus, Leo, Scorpio and Aquarius; then you’re being affected. My whole generation is feeling the effects of this eclipse since all people born in the Pluto in Leo generation which is roughly between the years of 1940 and 1957 are affected by these eclipses in Taurus/Scorpio via the square; especially if their Pluto is within orb or between 1 and 11 degrees Leo. Oh, I may be getting too technical. We’re just talking about what issues can cause concern when we look at the signs and houses that an eclipse affects. WHAT’S THE DIFFERENCE BETWEEN A SOLAR AND LUNAR ECLIPSE? ANSWER: Just as a general rule of thumb, solar eclipses are more external dealing with outer world events while the lunar eclipses are more emotional and internal. So let’s go back to April 25th. We checked the calendar/journal/schedule and reflected back to that last week or so of April a moment ago—was that more internal or external for you? We feel intensely emotional about something and that can result in taking the bull-by-the-horns so to speak and initiating an external event. I was re-thinking my whole approach to things at that time due to some emotional unrest and as a result did initiate a few outer world experiences. I will leave the details to your imagination. Eclipses have a profound effect on a person’s life—at least potentially depending upon what other planets it triggers. The tension may last only a few weeks; however the change that happens in that period can last a lifetime. Take, for example, the eclipse season of last summer as it relates to my own life. The move closer to my family—definitely true that things that have happened this past year did affect my life and the lives of my family and the affects likely will last a lifetime i.e. our relationships, memories and all of that. So there’s a good example. The intensity of the move—the packing up and moving in took weeks but the change? Well, pretty dramatic. Eclipses can illuminate areas of one’s life—like shining a light on the person, the path bringing into awareness something that beforehand was not being noticed. We could say something like removing a blind spot! I think that’s a good way to phrase it. Whatever has been pushed to one side or shoved under the carpet becomes obvious. Sometimes I think of eclipses as earthquakes—especially after last summer as well as the current energy. Today’s eclipse (May 9th 2013) is Solar and this Sun/Moon conjunction is closely (as mentioned earlier) merged with Mercury, Mars and most importantly the South Node. So past life or even this current lifetime’s past memories and past actions (Karma possibly-?) is being illuminated revealing, once again, possible blind spots. The next eclipse of this series is another Lunar Eclipse and occurs on May 25 on the full Moon. 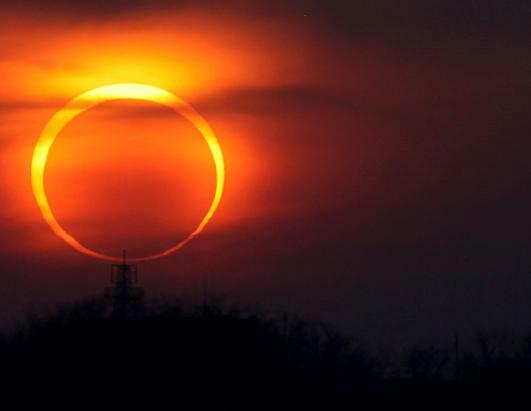 There are two eclipse seasons every year – lunar eclipses are the byproducts of any given solar eclipse. Therefore, the eclipse ahead of us on the 25th (Full Moon Lunar eclipse) is the byproduct of today’s New Moon Solar Eclipse. Today’s Solar Eclipse may bring events that we have not consciously precipitated or triggered and then the consequential upcoming Full Moon Lunar eclipse on the 25th will be associated with events brougth about by our own thoughts and feelings. Maybe by next month, if we don’t get it right now, we will be able to look back on this time period of 3 eclipses April 25 thru May 25th and figure it all out! Here’s to eclipses (raising my coffee cup to the air and not spilling a drop) and may the force be with you. I hope that we all receive some positive changes through this intense time period and I hope for you that your experiences are the intensely happy kind. May the odds be ever in your favor!